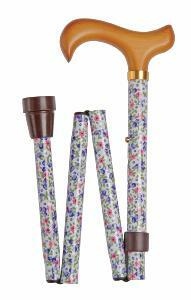 An attractive, height-adjustable folding cane suitable for everyday use. The natural coloured wooden derby handle provides excellent support and the cane is fitted with a non-slip rubber ferrule. The pattern features pink and purple flowers on a white background. The folding cane is height adjustable between 79-89cm (approximately 31"-35").